I had the flu in March that lasted about two weeks. After two rounds of corticosteroids, antibiotics, antihistamines and cough suppressants, I was still not feeling up to par. I decided I needed a cleanse to detox my body from all the medications and the flu itself. 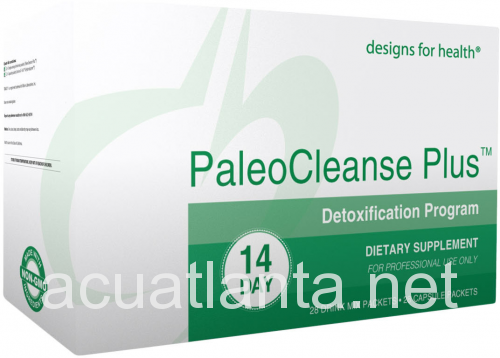 I didn’t want a harsh cleanse, so I chose the PaleoCleanse Plus from Designs for Health. Doing the cleanse was a great experience, and I was amazed at how easy it was. PaleoCleanse Plus consists of having two shakes a day, one regular meal, and two capsule packets a day that help support the detoxification process by insuring proper protein digestion. The cleanse lasts for 14 days. It was truly a gentle cleanse. The shakes taste great and they are very filling. The shakes are meal replacements, and I noticed I did not eat as much in between meals when I was taking them. To get the full benefit of the cleanse, it is recommended that you eliminate sugar, caffeine, alcohol, gluten containing products, dairy products, soy protein, desserts, fried foods and peanuts. The meals that you do eat are based on the Paleo Diet. My experience with the cleanse was that it was a little uncomfortable the first three days because I usually drink coffee and eat bread, dairy products and lots of sweets. I noticed my energy level was somewhat low and I didn’t feel like exercising. If your diet is like mine, I would recommend easing off of these foods and drinks the week before you start the cleanse. It is important that you drink filtered water at a rate of about ½ oz. per pound of body weight, so you are going to go to the bathroom more than usual. I substituted milk with almond milk, used green tea sweetened with stevia and in between meals I ate raw nuts and low glycemic fruits like grapefruit, cantaloupe and blueberries. For my regular meal I ate organic/hormone free chicken or salmon with vegetables, which I had at dinner time. You can use either breakfast, lunch or dinner to have your regular meal. I like grilled chicken, salmon or hamburgers made with grass feed beef so I used the “Barbie” most every day. After a few days on the cleanse, I felt great both physically and mentally. One extra benefit from the PaleoCleanse was that I lost about 10 pounds and lowered my body fat. I felt better than I did before I got sick. I would highly recommend this cleanse to anyone who wants to detoxify and kick start a good diet. It’s an excellent program to help you hit the reset button and make better daily choices for your health.